There are plenty of things to do while vacationing in Puerto Vallarta — whether you want to just relax on the beach and read a book or partake in a different excursion every day. 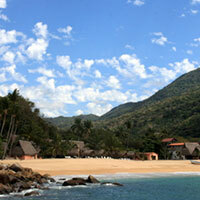 We personally like to take day-trip tours to the other beautiful beaches located in Banderas Bay. Here are a few of our favorites. Inquire at the foot of the pier for times and availability of water taxis to these locations. Los Arcos is the 3-rock formation visible (to the south) from the beach in front of the condo. 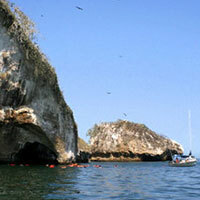 Under the towering rocks are natural tunnels that make it a popular spot for snorkeling, scuba diving and kayaking. It’s a quick boat ride from the pier (about 10 minutes) and is a fun place to see — the rocks don’t look that big from Los Muertos beach but when you get closer you realize just how gigantic they are! Playa Mismaloya is not only a beautiful beach, it’s also where the movie Night of the Iguana was filmed back in 1963. This location pretty much put Puerto Vallarta on the map as a tourist destination. Again, you can take a day tour here or stay for a few nights at the resort. There are a few restaurants here so no worries about finding food or drink. Again, there are activities available such as snorkeling and scuba diving, or just hang out in the sun and catch a tan. “Boca,” as it’s called, is a little bay-within-a-bay not far past Mismaloya. This marks the last part of the highway traveling along the sea — here it turns directly south, away from the beach. This destination is a bit larger than the others, offering many options for overnight stays, along with several restaurants for refreshments. One of the most beautiful restaurants in Puerto Vallarta — called Le Kliff — is located here. Once hailed in the Guinness Book of World Records as the world’s largest palapa, Le Kliff offers phenomenal ocean views from every table, and many people come here solely to get married on the beautiful archway overlooking the sea. As always, there are many activities to do in Boca, including snorkeling, fishing, kayaking, and scuba diving. This beautiful little getaway is a popular tourist spot. Take the water taxi right from the pier and it’s about a half-hour trip. There are lots of things to do at Las Ánimas, including hanging out on the beach, climbing around in the jungle (if you so wish!) or partaking in one of the many activities available, including snorkeling, scuba diving, kayaking or the Adventure Park. Another beautiful beach awaits you here in Quimixto. It’s not a large beach, but it offers restaurants for food and drink; clear waters for swimming; snorkeling and scuba diving; horseback riding and hiking tours up to the waterfall. Take a day trip (or stay for a few nights) to Yelapa, a quaint village nestled in a private bay with a beautiful backdrop of mountains. Approximately a 45-minute boat ride south of Puerto Vallarta, Yelapa is a quiet town but is host to many day-trippers who come to enjoy the quiet solitude and different atmosphere. You can still parasail and buy trinkets on the beach, but on a much more relaxed scale than PV. There are a few restaurant/bars right on the beach that offer chairs for you to sit in (and of course, cold beers, margaritas and Mexican fare!). Visitors can walk up to the waterfall (through the town of Yelapa) on a guided tour; be sure to stop at the woodworking palapa where the men fashion beautiful items out of rosewood. If you buy something, partake in a shot of raicilla – local moonshine – but be careful of the “kick,” it’s extremely strong! …we like to call it “going on vacation while on vacation” when we go there. There are many other small beaches and pueblos located along the rim of the Bahía de Banderas (Banderas Bay); the ones we’ve listed here are just a few we’ve been to. Don’t forget, you can visit any of these places just for the day or spend a couple of nights — and then return back to your home-away-from-home in Vallarta. Please visit our calendar to see the condominium’s availability for the time you would like to book. You can also contact us directly with an email or call 218-765-3017.